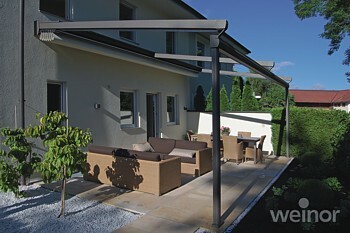 The Weinor Pergotex is an electric operated retractable fabric and aluminium roof cover system – opening and closing just as easily as the roof on a modern convertible car. 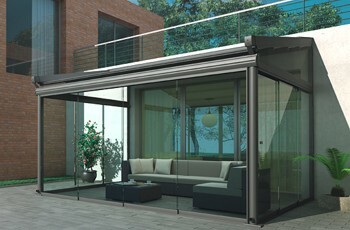 The versatile folding roof system offers a retractable patio or terrace cover capable of withstanding sun, wind, rain and even snow: its exceptional flexibility in design and sizing means it can be used in an abundance of environments for covering small or large areas at any time. 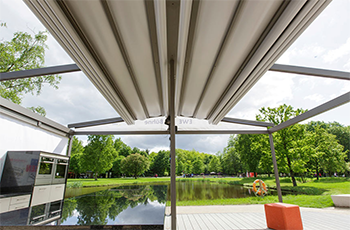 The Pergotex uses tried-and-tested technology from years of experience at manufacturing retractable awnings to make all this possible. When closed, it provides shelter from excessive amounts of sun, wind and heavy rain downpours. When open, it lets you enjoy the sunshine without feeling overclouded. The self-supporting structure even withstands strong winds. The motor takes all the effort out of opening and retracting the tear-resistant, light-tight and waterproof PVC awning material. The Pergotex is available in single unit sizes up to 7 metres wide with a maximum projection of 6.5 metres and can be ‘coupled’ to make larger units and also create a gable shape when bolted back to back. The unit is designed to fix to an existing building structure but also has the option to use a goalpost framework to be a stand alone system when required. 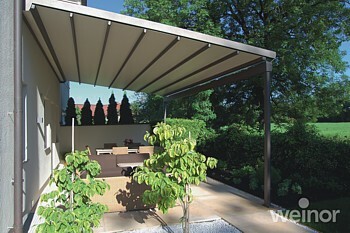 The tear resistant PVC fabric of the Pergotex is fastened to robust aluminium transom sections enabling the roof when extended to withstand wind strengths of up to 8 on the Beaufort scale, a wind speed where you most likely will not be outside sitting anyway. The minimum inclination of 8 degrees allows rainwater to drain forwards into a front mounted integral guttering system taking the rainwater down in the integrated drainage pipes in the support posts. The front support posts can be concreted or screwed onto the patio floor depending on the constructional circumstances. The sides and front of a Weinor Pergotex can be easily closed in using a choice of different systems including sliding glass doors, vertical zip blinds, retractable fabric side screens or simply fixed glazing sections. All this adds to the weather protection depending whether your patio is North, South, East or West facing and what kind of natural protection is already in place from existing structures around your home. The Pergotex works with your surroundings and gives you ultimate control from the diversity of English weather throughout the year. It gives ultimate control of the sunlight, heat and wind in an outdoor environment to enjoy your garden and patio all year round. The Pergotex can be easily operated using control methods such as wall switches, radio control handsets or even sun, wind and rain sensors. Such effortless control enables you to enjoy your outdoor area all year round controlling heat, light and inclement weather conditions as well as take yourself into the evening with the addition of lighting and eco friendly heating solutions if required. When extended the fabric roof is strengthened using aluminium struts fixed along the width making the roof strong enough for almost anything the British weather has to throw at you, including some snow! 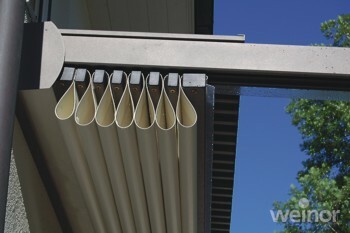 The Pergotex uses an extremely tough and durable fabric and as such cannot be rolled around a barrel like normal fabrics do in retractable awnings. 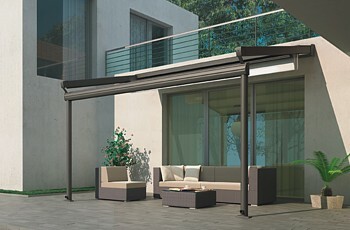 The fabric concertinas in neat folds when fully retracted and sits underneath a weather protection aluminium section all coordinated with the frame system colour chosen. The front aluminium profile section houses a built in rainwater guttering to collect and disperse the water down the drainage pipes inside the support legs wherever required. Operation is always by electric motor and controlled by a choice of methods usually tailored to the position and daily requirements of the system in the household environment. The Pergotex is a fantastic and modern solution to creating the best outdoor environment on a domestic or commercial premises and with super strong modern materials offers low maintenance for many years to come.